Unam Sanctam Catholicam: Where is the Ark of the Covenant? Being a history major in college and a lover of biblical archaeology, this topic has always fascinated me. 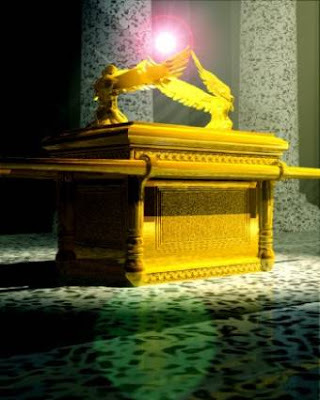 The Ark of the Covenant was the most sacred and revered object of ancient Israelite worship. Built under Moses and housing the Ten Commandments, some of the Manna from heaven and the rod of Aaron that budded, we know for certain that the Ark was installed in the Temple by Solomon around 950 BC. Furthermore, we know that there is no further mention as to its whereabouts after this (except for two cryptic references, which I shall go into later). It is not mentioned among the articles returned to the Jews by Cyrus and it appears to have been absent from the Second Temple. It was certainly gone by the time of the Maccabees (there is a reference to it in II Macc. that I will discuss). So what happened to this most important of all Israelite religious items? And, more importantly, why are the Sacred Scriptures apparently silent on this event? After the dedication of the Temple by Solomon, there are only three references to the Ark in the entire Old Testament. The first comes from II Chronicles 35:3, where good King Josiah says to the Levites: "Put the holy ark in the house which Solomon the son of David, king of Israel, built; you need no longer carry it upon your shoulders." It seems that he is telling the Levites to put the Ark back in the Temple. This insinuates that in the time of Josiah, the Ark was for some reason not in the Temple where is should have been. Thus, as he prepared to celebrate the Passover, the king found it necessary to instruct the Levites to put the Ark back in the Temple. Why would he have needed to command this? Why would the Ark be out of the Temple in the first place? Josiah reigned from 640-609 BC. He is known as a good and pious king who tried to do away with Israelite idolatry and reinstitute the precepts of the Law at the Temple in Jerusalem. But if we look to his predecessors, we find two of Judah's wickedest kings, Amon (642-640) and Manasseh (697-642). The Bible says Manasseh was the wickedest king of Judah, in fact, the one because of whom the destruction of Jerusalem by Babylon was decreed. His crime was that "he built altars for all the host of heaven in the two courts of the house of the Lord. And he burned his sons as an offering in the valley of the son of Hinnom, and practiced soothsaying and augury and sorcery, and dealt with mediums and wizards" (II Chr. 33:5-6). While normally we dwell on the sacrifice of children to Moloch in listing Manessah's crimes, in thise case we ought to focus on the fact that he "built altars for all the host of heaven in the two courts of the house of the Lord." Now, knowing that the Ark was the holiest object in ancient Israel, is it likely that the priests and Levites would have allowed it to remain in the Temple in the midst of such sacriligious worship and abominations as those which Manessah was practicing? Is it not feasible to believe that the Levites and priests removed the Ark for safe-keeping during Manessah's idolatrous and wicked reign? This would make sense of Josiah's command to return the Ark once he came to power and restored worship of the Lord. But did the priests ever return it? A verse from Jeremiah, written "in the days of King Josiah" (ie, prior to 609 and at least 25 years before the destruction of the Temple), seems to suggest that it was not. In Jeremiah 3, the prophet is speaking on the restoration of Judah following a period of chastisement and says in verse 3:16: "And when you have multiplied and increased in the land, in those days, says the Lord, they shall no more say, "The ark of the covenant of the Lord." It shall not come to mind, or be remembered, or missed; it shall not be made again." This is an amazing verse. It suggests that at the time Jeremiah was writing (sometime prior to 609, "in the days of King Josiah"), people were lamenting the fact that the ark was apparently gone. Hence the statement that it shall no longer be "missed." Why would it be "missed" if it were not missing? This verse from Jeremiah 3:16, coupled with the verse from II Chr. 35:3, seems to give us the following scenario: During the wicked reigns of Kings Manasseh and Amon, where idolatry was practiced within the very Temple precincts, the Levites bore the Ark away for safe keeping. With the ascent of the righteous King Josiah (c. 640), the Ark was ordered by him to be restored to the Temple. But by that time it had been gone for at least fifty-five years and perhaps it had been lost during this period. Thus the lamentation of the people during Jeremiah's generation, who cried, "The ark of the covenant of the Lord." But Jeremiah promises them a future restoration in which the Ark will no longer be "missed." All this is well and good, but all it does is set a chronology for when the Ark went missing; it does not say what actually happened to it. So where is it now? There are four generally accepted theories on the whereabouts of the Ark of the Covenant. 1) The Ark was either destroyed or carried away to Babylon by Nebuchadnezzar in the destruction of the Temple in 586 (the secular archaeological view). 2) The Ark is buried under the Temple Mount in Jerusalem (believed by many Protestant Evangelicals). 3) The Ark was hidden by Jeremiah on Mount Nebo shortly before the Babylonian conquest (Jewish tradition, adhered to by many Catholics over the ages). 4) The Ark rests in St. Mary of Zion Church in Zion, Ethiopia (the claim of the Coptic Church in Ethiopia). Each of these theories have merit, and it will take me more than one post to go into all of them. But here I will deal with simply the first theory, which I have dubbed the "Secular Archaeological View." According to this view, the dissappearance of the Ark is traceable to the Babylonian destruction of the Temple of Solomon in 586. The Ark was either (a) captured, or (b) destroyed. It seems unlikely that the Ark was captured and carried away as booty for three reasons. First, the book of Jeremiah lists all the items that were carried away to Babylon: "The Babylonians broke up the bronze pillars, the movable stands and the bronze Sea that were at the temple of the LORD and they carried all the bronze to Babylon. They also took away the pots, shovels, wick trimmers, sprinkling bowls, dishes and all the bronze articles used in the temple service. The commander of the imperial guard took away the basins, censers, sprinkling bowls, pots, lampstands, dishes and bowls used for drink offerings—all that were made of pure gold or silver" (Jer. 52:17-19). It seems that if the Bible lists even the "wick trimmers" and "sprinkling bowls" that were taken, he would have mentioned the Ark as well, which was certainly more important than these minor articles. 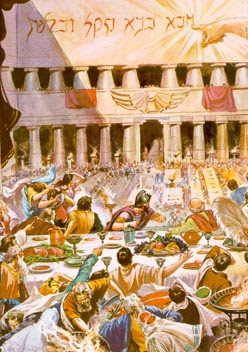 Second, in the book of Daniel, chapter 5, we see the feast of Belshazzar, where the Babylonian king orders all of the vessels taken from the Temple to be brought out to him so that he and his lords could drink from them. The miraculous hand appears on the wall and decrees that the kingdom of Belshazzar will come to an end, because "the vessels of the [God's] house have been brought in before you, and you and your lords, your wives, and your concubines have drunk wine from them" (Dan. 5:23). It seems that if the Babylonians had possessed the Ark, this would have been mentioned as well. If the kingdom of Belshazzar could be destroyed for sacriligious use of the Temple vessels, how much more for sacriligious possession of the holy Ark, which devastated the Philistines in the time of Saul? (see I Sam. 5). Third, the Ark is not among the list of items returned to the Jews by King Cyrus of Persia for the rebuilding of the Temple. The Bible says: "Moreover, King Cyrus brought out the articles belonging to the temple of the LORD, which Nebuchadnezzar had carried away from Jerusalem and had placed in the temple of his god. Cyrus king of Persia had them brought by Mithredath the treasurer, who counted them out to Sheshbazzar the prince of Judah. This was the inventory: thirty gold bowls, one thousand silver dishes, one thousand silver pans, twenty-nine censers, two thousand four hundred ten bowls of silver, and a thousand other vessels. In all, there were five thousand four hundred sixty-nine articles of gold and of silver. Sheshbazzar brought all these along when the exiles came up from Babylon to Jerusalem" (Ezra 1:7-10). Surely, in this minute inventory, the Ark of the Covenant would have been mentioned were it present. What about the possibility that it was destroyed by the Babylonians, as the Romans destroyed much of the Temple in a similar way in the year 70 AD? This seems unlikely mainly because it was not mentioned or even alluded to anywhere; it seems that the Jews would have written about it had it been destroyed, since it was the inner sanctum of their sanctuary. Besides all of these points, the Secular Archaeological View fails in a very important area: the verses we looked at above indicate that the Ark went missing before the Babylonians ever came to Jerusalem, at least 25 years before. Therefore, the Babylonians never saw the Ark. The only way the Secular Archaeological View can hold water is if we assert that the prophecy of Jeremiah 3:16 was written retoractively after the Temple destruction to look like a prophecy (similar to the way modernists interpret the prophecies of Daniel). But such an interpetation depends on anti-supernatural bias and is inadmissable to any Catholic exegete. I think we can say with confidence that not only did the Babylonians not take or destroy the Ark, but that it was missing long before they ever showed up. Next time, we can examine the second theory: perhaps the Ark is buried underneath the Temple Mount in Jerusalem.